A classic in the field of psychology, From India to Planet Mars (1900) depicts the remarkable multiple existence of the medium Hélène Smith, who claimed to be the reincarnation of Marie Antoinette, of a Hindu princess from fifteenth-century India, and of a regular visitor to Mars, whose landscapes she painted and whose language she appeared to speak fluently. 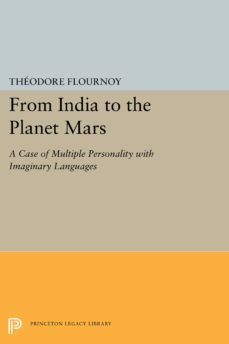 Through a psychological interpretation of these fantasies, which consisted in the subliminal elaboration of forgotten memories, Théodore Flournoy vastly extended the scope and understanding of the unconscious, and in particular, of its creative and mythopoetic capacities. In the introduction to this work, Soriu Shamdasani evokes the rich cultural and intellectual setting which Flournoy published his findings, and discusses their impact on Freud, Jung, and other pioneers psychology.Originally published in 1994.The Princeton Legacy Library uses the latest print-on-demand technology to again make available previously out-of-print books from the distinguished backlist of Princeton University Press. These paperback editions preserve the original texts of these important books while presenting them in durable paperback editions. The goal of the Princeton Legacy Library is to vastly increase access to the rich scholarly heritage found in the thousands of books published by Princeton University Press since its founding in 1905.